A musician, song writer and performer, Rodelio (Rod) Salaysay, RN, BSN sings as he plays his Ukulele, his gentle strumming bringing peace and tranquility to the seriously ill patients he cares for.” It’s hard to believe that I’m actually fulfilling my desire to be a musician in a way that I have never imagined….at the bedside and as a nurse and performer,” he said. Patients arrive at hospitals with serious physical problems; they stay for the long run to undergo treatments that promote healing and support their need to return to their lives. “I believe these patients need emotional and spiritual support, and as I was given a special gift for a purpose, I embrace it,” Salaysay said. “Trauma nursing is a different kind of care and patients stay on our unit from two weeks to several months and they get to know their nurses. On one occasion as I began to sing and strum my Ukulele a woman who’d sustained a serious stroke opened her eyes and smiled. Another time a family asked me to play as their loved one lay dying; after his death I had the privilege of performing at a celebration of life event held in his honor. 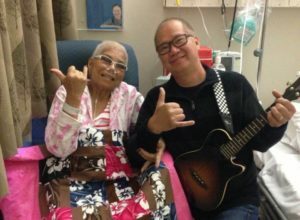 Patients may not remember the pain and fear, but they do remember my Ukulele and my songs. 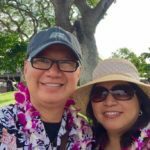 Salaysay’s nursing career began 35 years ago in the Philippines when, during his first year of college, he decided to teach himself how to play the guitar and memorized 25 songs to perform at community events as a way to support himself. ”As I didn’t have the funds to purchase a guitar I borrowed one from a friend and taught myself to play,” he said. Although he wanted to continue performing, Salaysay put this goal aside after he married his wife, Myrna and they had two sons. “The need to care for my family and continue my nursing career superseded my musical ambitions,” he pointed out. As time evolved and their sons reached adulthood, the Salaysay’s decided to change nursing careers opting to become travel nurses; they chose TruStaff, a Cincinnati, Ohio based Travel Nurse Company as their employer. “We enjoy travel opportunities and experiences to meet new people,” Salaysay said. Currently the couple is completing an assignment at the Los Robles Hospital and Medical Center in the City of Thousand Oaks, Ventura County, CA. Rod works on a 30- bed medical/surgical ICU unit and Myrna is an OR nurse. The Salayay’s second assignment with TruStaff brought them to the San Francisco Bay area. “Several years ago I wrote a song called Anniversary and sang it for my wife as we walked the Golden Gate Bridge on our wedding anniversary,” he remarked. During their stay the couple met a woman “who came to love what I do as a nurse and musician,” Salaysay said. “She invited us to join her on a trip to Kona, Hawaii.” After completing their third travel assignment the couple decided to go for a weeklong adventure, a trip that included a four mile hike to the lava tubes and medical volunteering during the last Kona Triathlon competition. Nothing’s hard if you believe…. EDITOR’S NOTE: I emailed Rod and asked him 3 more questions. His answers were so good I decided to add them verbatim. Here you go. “Hi Conrad. Sorry about the late response. But here it is, and my answers are based on my own experience. Any tips to a first time traveler on selecting their first assignment? When I decided to pursue travel nursing, I know what my goals are. To see and explore new places, to meet and make new friends, to learn and broaden my clinical experience and be rewarded financially while doing so. I still wanted to stay close to my home base though, that’s why I decided to pick a hospital/location where I can drive home and spend a nice weekend. Everyone has their own priorities but this is what’s important for me. Unfortunately, choosing the first hospital assignment can be really challenging. So I did my own research, and even drove up to the hospital to check it out myself. How do you select what recruiter to work with? I have applied to at least 3 travel agencies and my decision to work with my particular recruiter was based on his knowledge, experience and expertise. Someone who is willing to go for the extra mile to make sure that unforseen issues are met. He or she should be able to fully explain to you the pay package, benefits, bonuses and reimbursements. Any other advice to new travel nurses? The hardest party of being a travel nurse is find housing, learn the computer charting system and adjusting to the hospital “culture”. The nursing process will always be the same, but hospitals have their own unique policies and procedures. You can tell if its a good hospital if your co-workers are supportive and friendly. So far, from my experience, it’s been great so far. 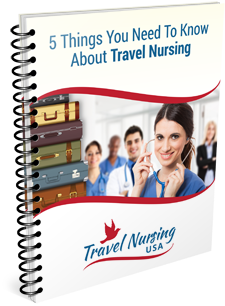 I wish I knew about TravelnursingUSA.com when I was starting out, because it offers a wealth of information necessary to become successful. Having said that, the bottom line is I enjoy what I do and my only regret is that I wish I did this travel nurse career a lot sooner. No, Thank YOU Rod! Check him out on CNN below. If you’d like to talk with Conrad and ask questions or have him do a travel nurse job search you can contact him HERE. I teared up the first time I heard that he played for his patients and heard him play!!! What a wonderful gift to give to our patients!! So glad you found your way to Los Robles! !